József Igácz, Mayor of Besence, Hungary (far right), welcomes expert meeting participants to the community. A European Expert Symposium Healthy Ageing of Roma Communities: Endowers – Realities – Perspectives, organized by the University of Pécs Medical School, Hungary in cooperation with the WHO Regional Office for Europe and sponsored by the Hungarian State Secretariat for Social Affairs and Social Inclusion, was held in Pécs on 27–29 October 2014. The experts adopted the “Pécs Declaration on Healthy Ageing of Roma Communities” in which they recommend numerous measures that are essential to implement for increasing longevity and improving health among Roma communities. Due to the harsh socioeconomic and environmental circumstances in which many Roma live, there are disproportionally few among the Roma as compared to non-Roma, who can look forward to old age with good health. “Despite the fact that health inequities between Roma and non-Roma are most accentuated in old age, older Roma are not included in research and policy,” said Dr Piroska Östlin, Programme Manager, Vulnerability and Health Programme, WHO/Europe. The experts recommend, among other things, the removal of administrative, financial and geographical barriers impending access to health services and empowerment of Roma communities to participate in policy developments and their implementation. 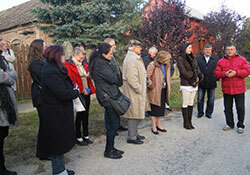 Participants of the meeting have visited the Ormánság Health Centre in Sellye, where they met representatives of local civil organizations and community leaders of the region to discuss challenges and opportunities for improving the health status of the Roma population. In the village of Besence, Mr József Igácz, Mayor of Besence, has informed the participants about the activities and efforts of the community to improve the living conditions and health of its mainly Roma population.